This season, we are hosting a large carrot variety trial by UW/Horticulture professor Irwin Goldman and graduate student Claire Luby. We try new vegetable varieties each year. Steve evaluates how well the varieties grow, while I judge their sweetness and flavor. This trial, however, involves much more than taste evaluations. Irwin and Claire have a radical plan. In his years as a vegetable breeder, Irwin has observed an alarming loss of traits that used to be available publicly. As companies patent specific plant traits, they become unavailable for public breeding programs. For example, breeding for red carrots used to be in the public domain. Now that trait has been patented, and breeders are forced to license the patented material or forgo breeding carrots for red color. Red color in carrots is a novelty trait; other patented traits are much more valuable. In planting this large trial, Claire and Irwin hope to identify unpatented sources of diversity. Their ultimate goal is to develop “open source” breeding lines for release with the stipulation that any varieties developed from their lines must remain unpatented. Irwin is a participant in the Open Source Seed Initiative (OSSI), a group of scientists working to develop open-source seeds for a variety of crops. Irwin told us “The open source model works on the principle that you can receive the seeds if you agree not to tie them up, but you can also use them in breeding, crop production, or even sell them. We hope this will also foster some additional breeding activities by gardeners and farmers who may want to save their own vegetable seeds and do a little breeding on the side.” This recent article (see p. 28) describes OSSI, as well as Irwin, Claire and others’ groundbreaking efforts to breed crops specifically for organic farming systems. These are big ideas that can help farmers everywhere. Grad student Claire Luby holds a few of the 150 carrot varieties she cajoled from companies and breeding programs across the USA. UW professor Irwin Goldman takes a turn planting carrots in a large variety trial at our farm. We appreciate the chance to participate in this effort, and the opportunity to evaluate such a wide range of carrot varieties. We almost always host trials when asked by the university. Vegetable farmers lack the financial clout of the corn, soybean or potato industries. Hosting trials is one way we support scientists researching organics or vegetable farming. Veggie List and Veggie Notes. 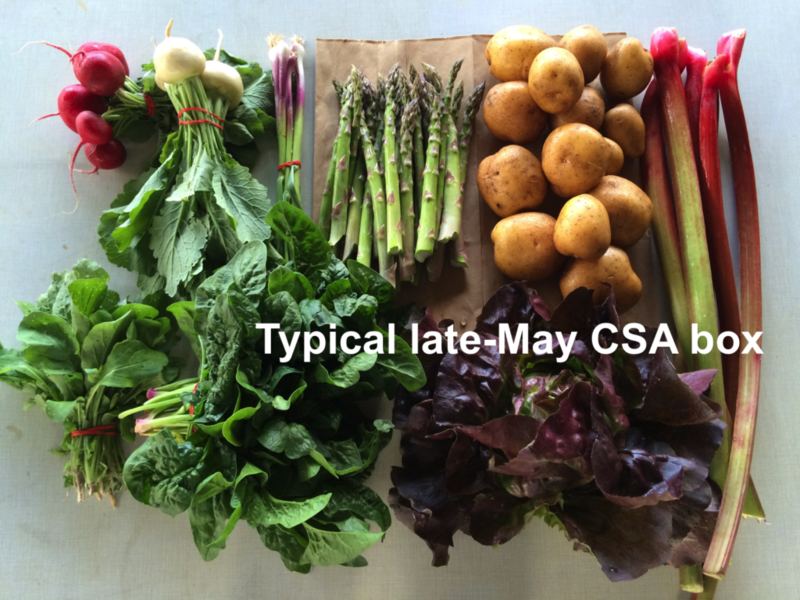 This week’s veggies show effects from both the recent wet weather and the recent dry weather. Pretty crazy. We’re harvesting during hot weather, so we suggest that you eat your lettuce and broccoli soon. Hot weather at harvest shortens their storage life. If your leafy vegetables seem wilted this week, submerge in a tub of cold water for 15 minutes to help crisp them up. This is a good technique for lettuce, greens, herbs and broccoli. A few sites will receive 2 Japanese eggplant this week. Next week’s box will probably contain green beans, cukes, zukes, and more. There might be melons to share too! Cabbage – This ia a nice salad-type that we grow in summer. It has thinner, more tender leaves than the usual green cabbage. Great in salads and slaws but can also be cooked. Lettuce – We can still grow lettuce during hot weather as long as we harvest it young. Please ignore the leaf spotting on some heads – it is a remnant of the wet spell that is now fading into distant memory. Broccoli – Eat soon. Broccoli harvested in hot weather (and stored with ethylene-producing summer crops) does not store well.